The same-day delivery scheme is still in the trial stages so it's not available everywhere yet but it could be rolled out to even more stores around the country if it's a success. The Co-op began testing out delivery last year for the areas around five stores in Manchester. This week, an extra 11 shops in London have been added to Deliveroo, the online food delivery service. The catch is that there's a £3 delivery charge – but for that price, some shops say they can deliver your items in just 10 minutes after you order. Deliveroo told The Sun you have to live within a 2-3km radius of shops and restaurants on its service to be able to order from them. Shoppers can now also order groceries for delivery from a small number of Nisa convenience shops, as the chain is owned by the Co-op. There are more Nisa shops available on Deliveroo than the Co-op so far, and they're in London, Manchester, Leeds, and Swansea. The scheme means shoppers can order groceries from the chains without leaving the house. Not everything in the shops will be available to buy on Deliveroo, but the service does offer a wide range of chilled, frozen and store cupboard items. You can order beer, wine, spirits, sweets, snacks, ready meals, bread, pasta sauce and even milk to your door using the Deliveroo app or website. There's also a range of toiletries on offer, including tampons and toilet roll. A spokesman for the Co-op said: “We have extended a partnership with Deliveroo to make access to our products and services even easier for consumers." 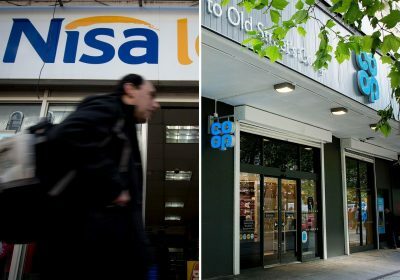 There are more than 4,000 Co-op shops and 2,500 Nisa stores across the UK. You can find your nearest Co-op using its online tool, and your local Nisa branch on its website too. The Co-op currently has an offer on three types of Creme Egg ice cream which all cost £1.50 each. The supermarket chain has an £8 Valentine's Day meal deal on this week, which includes steak. We pay for your stories! Do you have a story for The Sun Online Money team? Email us at [email protected]e-sun.co.uk or call 0207 78 24516. Don't forget to join the Sun Money's Facebook group for the latest bargains and money-saving advice.